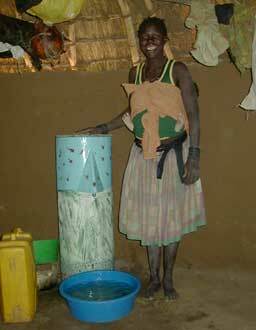 Bio-sand filters can be made in very many ways. Most common is the use of concrete, for which a metal mould is required. However, the use of metal oil drums, plastic bins or pre-fabricated or ready made plastic filters is also possible. Each version has its own application and by clicking on the links to the left you can easily find out which filter model suits your needs. We have developed some handy construction guidelines for concrete filters and their moulds, which are freely available for download. They can be found in the section dealing with concrete filters. Note that there is some recent research that has come out that highlights the importance of pore volume, hydraulic loading and sand size used. The practical application of this research to possibly tweak the design of the concrete filter is discussed in the section dealing with concrete filters. However, the same principles should be kept in mind for all types of intermittent-flow sand filter designs.